The Odd Gifts are the solo project of Ondřej Galuška, the guitarist, trombonist, singer and song co-author of Eggnoise, with whom he has recorded four albums. For their record Albumen Eggnoise received three nominations at the Just Plain Folks 2009 Music Awards, the biggest independent music awards in the world. In 2015 eggnoise performed a concert in the Millenium Park in Chicago and accompanied Jim Peterik (The Ides of March, Survivor), the co-author of the world super hit Eye of the Tiger. The first album of the project entitled O.G. and the Odd Gifts was released in 2012 and was listed among the 14 best records of the year by Czech Radio Pardubice programme Neon. It received the Harvest Prize at the independent TAIS Awards. Ondřej Galuška is also the co-author of the soundtrack to the Holy Quaternity, a film by Academy Award-nominee director Jan Hřebejk. His version of the song Tea and Crumpets appears on the album Bazarem Proměn: A Tribute to Vladimír Mišík (Indies Scope 2015). In 2015 Ondřej Galuška published a book entitled The Body of Music (Tělo hudby), a work in the philosophy of music. 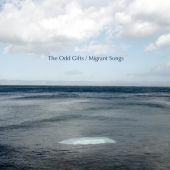 On 30 August 2016 the second album of The Odd Gifts project entitled Migrant Songs is to be released. It features James Harries, Alasdair Bouch, Justin Lavash, Bijou Camara and many more.